A missing Relationship Story Throughline and a deficient Main Character Throughline steer this narrative towards propaganda. As covered in the Throughline analysis of Christopher Nolan’s WWII thriller, Dunkirk is not a complete story. The lack of a fully-developed Relationship Story Throughline and a weak and deficient Main Character Throughline causes the film to come across more like propaganda, rather than narrative argument. Enough of a story exists, however, to warrant a closer look and perhaps suggest ways to develop the film into a complete narrative. Propaganda is a method of leaving out key parts of a story to coerce or manipulate the viewer to fill in the missing pieces with their own experience. By becoming a part of the story-forming process, the viewer unknowingly subscribes to the original Author’s point-of-view. Films like Moonlight or Sicko employ this method as a means of increasing emotional attachment. When done inadvertently, as it is here in Dunkirk, the technique distances the viewer and removes them from experience–unless they possess a patriotic appreciation of the United Kingdom. 400,000 men lie trapped on the northern coast of France. This problematic Situation sets the Domain of conflict for the Overall Story Throughline perspective. To get “Home” and survive this Overall Story Concern of the Present, the United Kingdom must find a way to overcome their universal problem of Potentiality. The potential disaster of losing all these men. The potential disaster if a ship sinks within the Mole. The potential disaster of taking on more men in a crowded boat. Everywhere you look, the narrative of Dunkirk depicts the negative results of being driven by potential. The triumph of Dunkirk is the triumph of Certainty over Potentiality, as seen from the objective point-of-view provided by the Overall Story Throughline. One clear example of this dynamic plays out within the final moments of the Heinkel bombing the minesweeper. Towards the end of Dunkirk, a German Heinkel arrives on the scene and bombs a minesweeper, capsizing the boat. British sailors evacuate and situate themselves on top of the floating hull. Safe and sound, they await rescue…until the Heinkel comes around for another pass. Driven by the potential of the bomber unleashing another successful volley, the sailors leap into the sea only to discover another, far greater problem: oil leaking from their ship. The British Spitfire swoops in, disables the Heinkel, and sends the burning bomber plunging straight into the oil spill. The sea ignites in a fury of flame, killing many of the sailors who sought the ocean for safety. The foundation of meaning within this sequence rests on this Problem of Potentiality. The potential of being killed drives the sailors into a far more disastrous situation. Had they remained on the overturned minesweeper and relied on the Certainty that the Spitfire would save the day, they would all be alive. The same dynamic plays out in the sequence where young Peter (Tom Glynn-Carney) locks the Shivering Soldier (Cillian Murphy) in the small cabin below deck. The potential danger apparent in the shell-shocked Soldier motivates Peter to lock the door, creating a worse situation: the Soldier panics, climbs upstairs, and in his state of heightened anxiety accidentally knocks George(Barry Keoghan) on his head. If Peter hadn’t been motivated by Potentiality and instead possessed some of the Certainty, his father Mr. Dawson (Mark Rylance) portrayed, George would still be alive. The Influence Character Throughline of a narrative provides a unique point-of-view that challenges individual approaches towards solving problems. 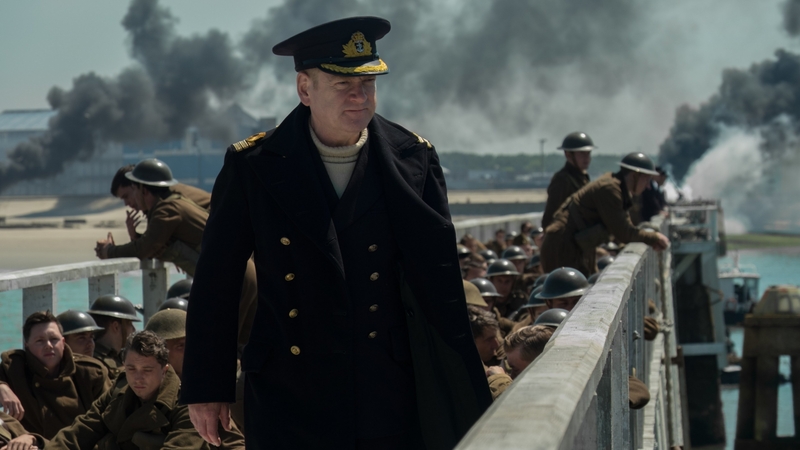 In Dunkirk, Mr. Dawson supplies this perspective by influencing Manners of Thinking. While many panic at the potential disaster that awaits, Dawson keeps calm and carries on, refusing to overreact. In the Dramatica theory of story, the element of Reaction is defined as actions made in response. Problems of overreacting and problems of refusing to overreact look to the same element when considering their source of conflict: Reaction. Mr. Dawson’s Influence Character Problem of Reaction motivates him to calmly single out the best course of action while everyone else runs around like a chicken with their head cut off–injecting the Influence Character Symptom of Induction/Overall Story Symptom of Induction and the Influence Character Response of Deduction into the narrative. This alternative approach towards solving problems influences and challenges those around Mr. Dawson to think differently. The conflict and inequity he introduces in the narrative through this concentration on Induction and Deduction push the Main Character of Dunkirk to alter and eventually Change his point-of-view. If only we could accurately gauge the Main Character of Dunkirk. In addition to the objective view provided by the Overall Story Throughline and the singularly unique point-of-view given by the Influence Character Throughline, a complete narrative calls upon the Main Character Throughline to offer the Audience an opportunity to experience conflict first-hand. Usually, an easy thing to determine (especially in stories named after the Main Character, like Logan or Wonder Woman), the Main Character point-of-view butts heads against the Influence Character point-of-view…if they’re in the same scene. In Dunkirk, Mr. Dawson functions as the apparent Influence Character while Timothy (Fionn Whitehead) offers our only way into the narrative. From the first scene to the last, we experience the terror of not being able to see the enemy, from Timothy’s point-of-view. Timothy’s focus on the unknown potential lying just around the corner is the same exact Potential motivating the Overall Story Throughline. In a complete narrative, the character who changes their resolve and adopts the competing approach to solving problems shares the same exact Problem and Solution as the Overall Story Throughline. This relationship is one instance where the various Throughlines weave together and gives meaning to the story’s events. The Audience sees the problem with Potential both from within and from without–something they can’t possibly do in their real lives. Timothy’s growth–or Character Arc–plays out through the shift of his Resolve from his original Main Character Problem of Potentiality to his Main Character Solution of Certainty. His journey to that point requires a Main Character Growth of Stop. Once Timothy stops taking orders, and begins thinking for himself–his ability to be certain about the choices he makes falls into place. In the end, Timothy accepts death if he must, because he would rather die with the certainty that his friend was not a German spy than live with the potential of killing an innocent man. Timothy grows to a point where he adopts Certainty into his Throughline with his defense of the Dutch stowaway–but he does so without the personalized influence of Mr. Dawson. The young man changes just because, and because that’s what characters do. The entire purpose of the Influence Character Throughline perspective is to challenge the Main Character to reconsider their perspective. Without that influence, no significant catalyst exists to motivate growth within the Main Character and development feels forced and unnatural. True, the Dutch deserter shares some of the qualities of Mr. Dawson, making him a candidate for a hand-off Influence Character, yet not enough exists to warrant a full 180-degree turn on the part of Timothy. The result sort of works, but feels forced because of the lack of integration between these two important Throughlines. With Timothy stuck on the beach, Peter appears to fill in for Main Character as he experiences his father’s influence directly. While not enough exists to label Peter the Main Character, he too experiences a paradigm shift with the Shivering Soldier encounter. Peter begins their meeting motivated to overcompensate because of the potential for this shell shocked soldier to go off his rocker. Peter locks the cabin door, the soldier panics, climbs upstairs, and inadvertently knocks George on his head. Later, the Shivering Soldier asks Peter if George is going to be OK. Knowing George to be dead, Peter responds, ”He’ll be fine”–a recognition of what the shell shocked soldier has been through, and a realization that calm is contagious. This element of Certainty feels similar to Timothy’s defense of his Dutch friend, placing Peter in the correct position to explore the resolution of the Main Character Throughline. But it also feels like Acceptance. The final perspective afforded by a complete narrative is the Relationship Story Throughline. Here, conflict plays out from the point-of-view what we struggle to resolve. Existing outside of any association within the Overall Story Throughline perspective, this Throughline explores the relationship between the Main and Influence Character. The application determines the one storyform out of 32,768 that matches the narrative of Dunkirk. In addition to pointing out the Main Character Problem and Solution of Potentiality and Certainty and the Influence Character Problem of Reaction and Symptom and Response of Induction and Deduction, the storyform singles out a Relationship Story Problem of Non-Acceptance and a Relationship Story Solution of Acceptance. These two elements and the additional elements resting within this Relationship Story Throughline need encoding within the narrative for Dunkirk to feel complete and emotionally fulfilling. Little exists that satisfies these requirements. In the Dramatica theory of story, Acceptance is defined as a decision not to oppose which is precisely what Peter does there at the end with the shell shocked soldier. Driven to oppose any and everything the soldier engages in or says, this emotional shift resolves the relationship between Peter and the soldier and brings needed heart to a logistical account of the conflict. It feels right, but it feels unearned and underdeveloped. The relationship between Peter and the soldier fails to differentiate itself from their relationship within an Overall Story Throughline perspective. They are brothers-in-arms in a potential Relationship Story Throughline, and they are brothers-in-arms from an Overall point-of-view. The only relationship that exists outside of an overall story concern is the father/son dynamic between Peter and Mr. Dawson. Here, we sense a heart-some connection beyond the affairs of the current war–but this too fails to develop adequately. The Relationship Story Problem of Non-Acceptance fails to motivate their father/son dynamic, and while there is a head nod at the end signaling a modicum of Acceptance, it does not feel quite as heartfelt as the Acceptance played out between Peter and the shell-shocked soldier. In short, the narrative of Dunkirk breaks in the area of the Relationship Story Throughline. Potential candidates exist for a relationship dynamic outside the concern of getting the boys home, yet these opportunities fail to develop in any meaningful and significant way. Also, the lack of a Main Character Throughline motivated by a clear and impactful Influence Character Throughline trends the narrative towards propaganda. Characters grow and develop because they must, not because of any connection to a complete and well-nurtured narrative argument. Of course, it may have been the Author’s original intent to provide a patriotic display of British resilience under challenging and insurmountable odds. If this is the case, then Dunkirk succeeds in fulfilling its original purpose. One cannot hope but feel an overwhelming sense of pride when the boats arrive or when Churchill delivers his speech, all set to the swelling and moving notes of Edward Elgar’s classic Variation #14. For a narrative to survive outside the realm of patriotic indulgence, it must complete the argument with four fully-developed Throughlines. By addressing every point-of-view and accounting for every perspective, the Author guarantees respect for the Audience regardless of background or nationality. In the end, we want a great story; one where we can find meaning and one we can return to time and time again. The presence of all Four Throughlines secures both–allowing us to keep calm and carry on with a greater understanding of how to survive in this world.